With spring just around the corner I have thought about getting my mountain bike out for some pre-riding maintenance. It is always very important that you make sure everything is functioning correctly on your mountain bike before hitting the trails. Here are a few maintenance tips and gear you might want on the trails. If you don’t check the brakes before your first ride of the season, and you find yourself cruising downhill at high speeds, you may not be able to stop quick enough. Over time brake fluid will either leak, air can build up in the lines, or it will deteriorate causing less than ideal breaking conditions. It is very important you do this or take it to your local bike shop. Just this past season I replaced my tires with some wider ones. I had to do this because my tires were pretty old and not only was the tread starting to wear but I was noticing small punctures more frequently. Over time the rubber compound that makes up our mountain bike tires will wear down. And when you are out mountain biking you need to rely on those tires to grip so you don’t find the side of the trail or ravine. I have seen it many times before. You just started your epic mountain biking adventure for the day and about 5 minutes into the ride you catch a flat. Dang! If you don’t bring any backup tubes your day is over before it began, so make sure to pack at least one extra into your backpack or small pack attached under the seat of your mountain bike. This is a new product to hit the market and it is awesome. It is a drybox that you can have on your back, or connected to your backpack that is waterproof and military grade drop tested. Not only that, but it has a solar panel built into the case and a huge battery built in with 2 USB ports. When my friends and I ride, we like to get some cool footage with GoPro cameras and our iPhones, so having this is key to keep charged and also recharge those GoPro batteries when they die quickly. Some might say it’s a little too big to have on your back when mountain biking, but its much smaller and very lightweight than you might think. Always a must have when I am mountain biking. Have you ever tried mountain biking at night? It is AWESOME! If you want to give it a try always go with at least one other rider and make sure to have a light attached to your bike so you can see what’s up ahead and also so other riders can see you. Again, these things run on batteries, and most of them can be recharged with a USB cable. The RokPak Pioneer Series comes in handy again. These are just a few tips before your next ride. Spring is just around the corner here in the US and we can’t wait to start mountain biking as much as possible. Make sure to at least check your brakes and tires, and check out some of the gear we mentioned. For your 4wheelers, ATVs, side by side & dirt bikes too! If it can handle the shocks involved in mountain biking, I would be highly impressed. 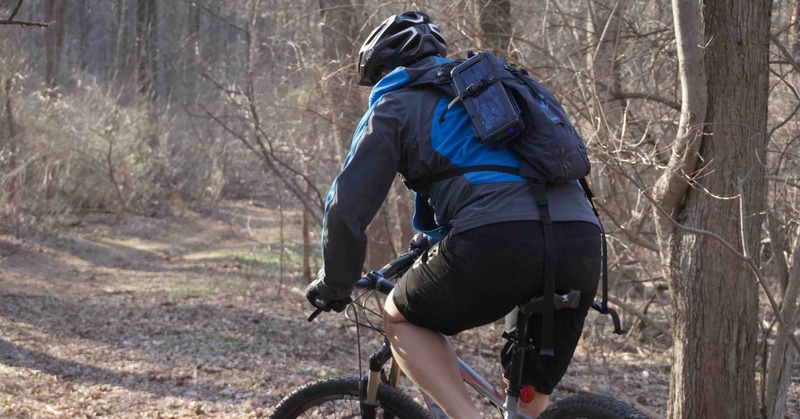 RUGGED IS GOOD WHEN YOU’RE MOUNTAIN BIKING..ROKPAK IS THE RIGHT TOOL. No mayyer where you go, it is a great idea to have a RokPak power Pack in your gear “just in case”. Some good mountain bike tips for being prepared. I do get concerned about the effect of all the bumps on my cell phone. Maybe a Rokpak would be a better way to protect my phone than the handlebar holder I use now. This might be one of the better portable small scale solar kits I’ve seen. If you go “off the beaten path”, no matter for how short a ride, be sure to have your safety gear with you – your cell phone and RokPak – you never know what will happen!